Celebrate the 25th year of Eucalyptus with Thymes! 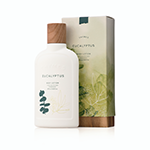 Adorned with a silver bow, the fan-favorite Eucalyptus Body Lotion is dressed for a celebration! Its invigorating aroma and nourishing ingredients make it a daily go-to for both men and women.